Anthony and Cleopatra is the last of seven novels, collectively called the Masters of Rome series, covering the end of the Roman Republic in all its twisted glory. The result of this herculean task, is a legacy of some of the best researched historical fiction of this time; meticulously covering politics, battles, people, religious rites, traditions, trade, architecture, etc. The best books of the series draw the reader in with fascinating characters, Machiavellian plots, and scintillating detail. The worst give the reader the sense of reading an entertaining history book. Which is not, necessarily, a bad thing. McCullough had intended to end the saga with The October Horse, but avid fans prevailed and she concluded with this novel, which shows the final end of the Republic and beginning of Empire. I found Anthony and Cleopatra to be one of the weaker books in the series, but still enjoyable. McCullough’s admiration for Caesar was evident in every book in which he appears. Now that he’s dead, she seems to have lost her inspiration. Octavian (Caesar’s heir and grand-nephew) is decidedly colder than Caesar, more cerebral; not good at battles, but superb at politics and manipulation. Agrippa, one of the more admirable and interesting characters, is his battle arm and sounding board; a loyal and shrewd friend who is popular with the people and the army. 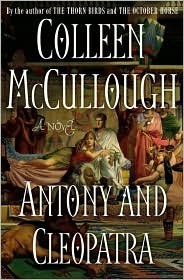 Although the book is titled Antony and Cleopatra, McCullough gives just as much ink to their rivals as to the titular characters. A good thing, because I knew less about their story. In this book, McCullough sets up an East/West culture divide. The monarchs of the East are treacherous, untrustworthy, murderous, worship strange gods, and wield absolute power for their own aggrandizement in their kingdoms. The Romans have honor, rule by laws, representative government; and when one person has to rule the Senate and People of Rome; it’s for a limited time only and for the good of the Roman people, not the individual wielding power. At least, that is what the men seizing power in Rome tell themselves and the people. McCullough shows us the hypocrisy in that thinking, the inevitable decline of the republic and the ultimate triumph of Empire. Cleopatra runs afoul of this divide and is incapable of truly understanding her rival Octavian, his motives or his plans. Antony doesn’t have the intelligence or subtlety to understand that Octavian and Agrippa are setting him up for a fall. At every juncture, he makes the wrong decision. Chin on her hand, Cleopatra watched Caesarion as he bent over his wax tablets. Sosigenes at his right hand, supervising. Not that her son needed him; Caesarion was seldom wrong and never mistaken. The leaden weight of grief shifted in her chest, made her swallow painfully, to look at Caesar’s son was to look at Caesar, who at this age would have been Caesarion’s image: tall graceful, golden-haired, long bumpy nose, full humorous lips with delicate creases in their corners. Oh, Caesar, Caesar! How have I lived without you?…And always, she thought, I made the wrong decisions….Without Caesar to guide me, I proved myself a poor ruler. McCullough tries to make up for the lack of suspense in this well-known story, by populating the book with dozens of secondary characters, exploring the twisted politics of all the various rulers, and providing wonderful and telling details that transport the reader to that faraway time and place. She is brilliant at showing us how people thought and acted in those times; their motivations, superstitions, the philosophy and culture that shaped their lives; and how different it was from our own. Unlike many novels of this time, the women don’t disappear. Not only Cleopatra, but Antony’s earlier wives come across as tough and shrewd. And where would Octavian be without his mate Livia or his sister Octavia? The misogyny of Roman men is a key element in the story and even blamed (to some extent) for the Antony’s downfall. Cleopatra was a female ruler with great power and wealth. Antony’s male Roman advisers resented her and ultimately defected. In the end, I wasn’t happy with the portrayal of Cleopatra, but McCullough’s version is well routed in the research and is true to her narrative. In summary, I enjoyed the book, but not as much as the earlier ones. I have nothing but admiration for the McCullough’s accomplishment with this series, but some readers might find her writing tough going. For people who like a complicated story, multiple characters and meticulous details, I recommend the series. Reading from the beginning is best, but Antony and Cleopatra can stand on its own. If you want a more rounded take on Cleopatra, I’d recommend the biography Cleopatra: a Life by Stacy Schiff. Please note: I purchased this book. The opinions in the review are my own. I read the first couple of these and they just didn’t hold me. The writing style was too trash-novel for me, although I usually do enjoy historical novels. Your example above has a perfect bit of this: “Caesarion was seldom wrong and never mistaken. ” What the heck does that even mean? I mean, are you being paid by the word, Colleen? I’ve named this year my “fiction year”….tho’ I still find myself taking refuge in non-fiction. The more fiction I read, the more I feel like I know which books I will use for kindling in an emergency of cold. I did not know that the book I am reading now is the 7th of a serie!